Electronic Concepts & Engineering | ECE, Inc.
ECE designs and manufactures high-reliability electronic products and software solutions. We specialize in the Military, Aerospace, Automotive, and Industrial market segments. Electronic Concepts and Engineering, Inc. has been successfully developing and producing cost-effective embedded electronic systems for use in a variety of rugged environments since 1991. Our in-house expertise allows you to realize the benefits of cost-effective, reliable electronic products and systems that your customers expect. Our Engineering staff consists of multi-disciplined, industry-experienced, licensed Professional and advanced degreed personnel. These experienced resources let you augment your in-house capabilities with precise skills in circuit design, system analysis, software development, printed circuit design, product qualification testing, manufacturing, system integration and more! Electronic Concepts and Engineering, Inc. is a proven full-service electronic OEM product development and manufacturing supplier that has successfully developed solutions for numerous Fortune 500 companies as well as many smaller companies. 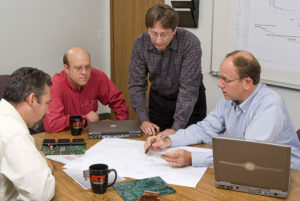 Let our team of experienced engineers help make your project a success.